Welcome to day 19 of my Countdown To Christmas Cookie Recipes. 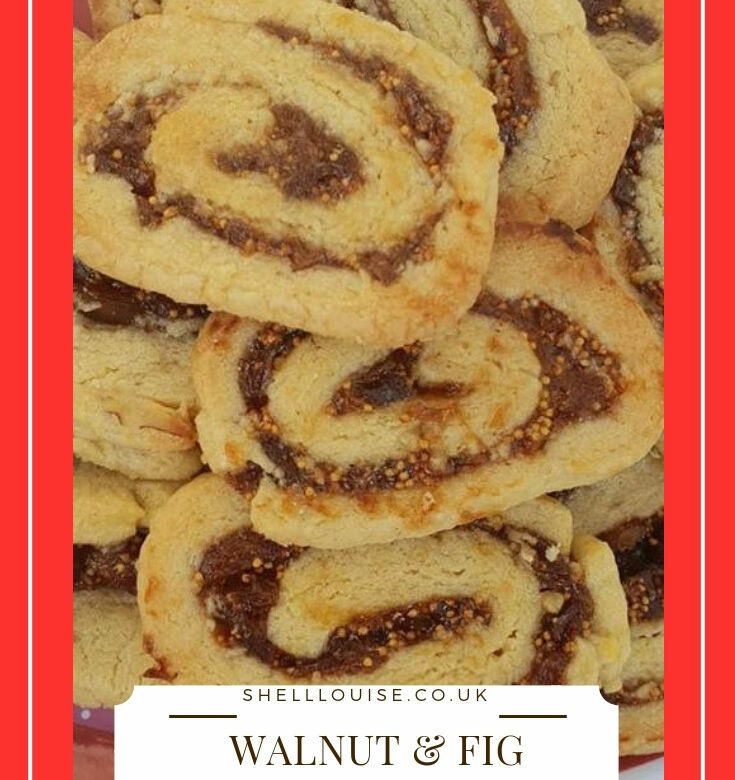 Today’s recipe is for Walnut & Fig Pinwheels. Tomorrow’s recipe is for Christmas Tree Cookies. Put the butter and 140g of the sugar into a bowl and mix well with a wooden spoon then beat in the egg yolk. Sift together the flour and salt into the mixture then add the ground walnuts and stir until thoroughly combined. If the dough is too sticky, work in more flour until it doesn’t stick to your hands. Shape the dough into a ball, wrap in clingfilm and chill in the fridge for 30-60 minutes. Meanwhile, put the remaining sugar into a saucepan and stir in 125ml of water then add the figs, mint tea and chopped mint. Bring to the boil, stirring constantly until the sugar has dissolved then lower the heat and simmer gently, stirring occasionally for 5 minutes. Remove the pan from the heat and cool. Unwrap the dough and roll out between 2 sheets of baking paper into a 30cm square. Spread the fig filling evenly over the dough, then roll up like a swiss roll. Wrap in clingfilm and chill in the fridge for 30 minutes. Unwrap the roll and cut into thin slices with a sharp serrated knife. Put the slices on the prepared baking sheets, spacing well apart. Bake in the preheated oven for 10-15 minutes, until golden brown. Leave to cool on the baking sheets for 5-10 minutes, then using a palette knife, transfer to wire racks to cool completely.